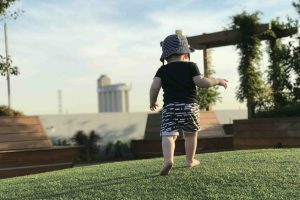 As a first-time parent, I’m learning things each and every day about not only my son, but myself and how to be a good mum. My son turns two very soon and I’ve been reflecting on how life has changed (for the better) and what he’s taught me over these almost 24 months together. Babies and toddlers don’t need lots of expensive toys to be entertained. They find joy in the simple things so easily, and if given the chance, will often be enthralled with an activity without needing too much guidance. Happily digging through the Tupperware drawer in the kitchen leads to an impromptu game of stacking cups, or playing with the box rather than the item that came in it. Finding happiness in the simple things is something I’m trying to do more of myself. We regularly head out to play in our local playground. I’ve watched my son be hesitant about climbing the ladder to get up to the slide, but just recently he climbed the ladder unaided for the first time. The sense of accomplishment he had for climbing it on his own, and then going down the slide was pure joy. He ran over to me at the end with a huge smile and his arms outstretched to give me a big hug shouting ‘I did it!’ It made me realise we need to celebrate the little obstacles we overcome in our daily life more often and with others. As we go about our day-to-day activities, people (and things!) are treated to a smile or wave from my son as we pass by. He will wave to cars and trucks, a plane or helicopter overhead, even a dog or caterpillar. When we travel on the tram and he says hello to other passengers (who are usually too engrossed in their phone or book to notice the person across from them), it’s nice to witness someone taking a second to smile or wave back at him. I think they benefit from it more than he does after this brief interaction of happiness in their perhaps otherwise ordinary day. I try and smile and say hello to people now too in the hope that it brightens someone’s day. He has taught me that no matter what, I’ll always love him and he lets me know he loves me too. While he hasn’t quite mastered saying ‘I love you’ on a regular basis, he shows me in so many other ways, like when his little paint covered arms squeeze me tight around the neck when he hugs me after being at childcare, or when he relaxes into my lap for our night time book before bed. It has made me try to tell my husband and family that I love them much more often, and to try and find ways to show them too. I know we all say that we try and do this, but toddlers do this naturally. To stop and watch a kite flying in the sky with such awe or marvel at some ants on the footpath on our walk around the neighbourhood. My son often makes me realise that I take so much for granted and that I need to put my phone down, worry less about things I ‘should’ be doing and immerse myself in the here and now. Natalie Moutafis is Executive Projects Manager at ISV, mother of an almost two-year-old, and our My Tiny Human parenting blogger.